If teaching is hard work then let’s do what’s necessary to make school better for all. Most high schools timetable their teachers, students, rooms, and resources into 5 or 6 subject slots each day. To ensure teachers don’t burn out, schools offer teachers one of those daily slots free from students to prepare and mark work. The timetable ensures that at any time, some teachers, some rooms, and some resources are not accessible to students. The students move every hour between subjects leading each teacher to prepare different activity for about 5 classes a day, each class containing about 28 students. This system shows little respect or faith in either teachers or students to organise their time and resources. The reason the average high school class size is 28 students is because there will be teachers and rooms in the school with no students. Many high school teachers see 100 students a week and are expected to mark all work assignments issued. Standardised assessment leads to tedious and demoralising marking for teachers, who exist in a personalised and dynamic world and are thus abandoning the profession in droves. The thousands of schools around the world that have switched to a learner-driven and/or project-based structure find that they can simplify and improve their use of time and facilities for both teachers and students. The students are engaged in projects they have at least partly, if not fully devised themselves with curriculum mentoring from teachers. The respect shown to students by a PBL system can lead to such trusting situations that the schools condense the usual non-teaching time for teachers into one time slot of free time for ALL In doing so, each teacher has less students to worry about at any time. 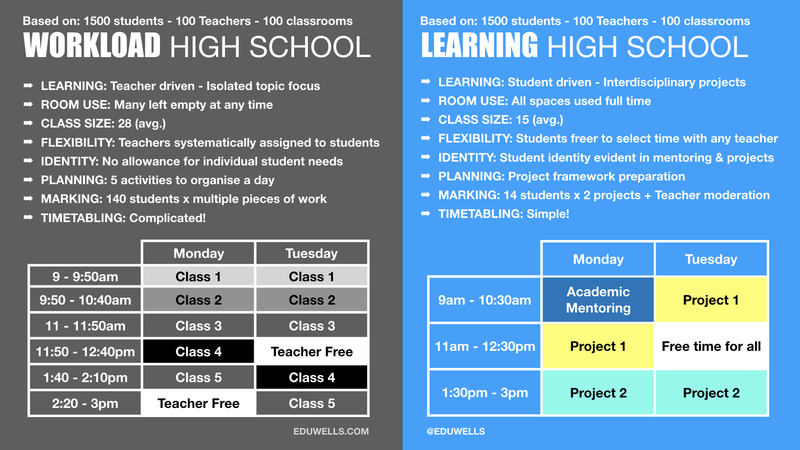 This timetable below is from a blog post by a PBL teacher, Steve Mouldey. Ideas for using an existing High School for PBL. It’s easier implemented as a full school and not in a separate programme. All teachers take on a general academic mentoring group to focus on learning and project progress. They in-turn act as specialist go-to people within projects. Teachers share the planning and monitoring of projects which makes the measuring of progress more palatable than traditional standardised and isolated teaching and marking. As a school leader, I’m very aware of having to support teachers who have the full range of perspectives on change and ‘modernisation.’ I understand many of the common reservations around losing academic rigour and control over the subject matter and can point to a number of examples where these worries can be relieved. But in addition to a growing evidence worldwide a practical note, few teachers argue against an idea that reduces workload, admin, stress, and monotony, while reducing the number of students you’re having to focus on. Highlighting that students find school boring is nothing new and this has never changed most teachers’ approach but a practical improvement in workload might just help shift some mindsets.